The Happy Bunny is an ideal option for filming, pilots, photo shoots, advertising and music videos. Please contact us for more information, or perhaps come and see us, look around the boat and discuss the possibilities. By making the most of this boating facility, filming or photography can include still or motion shots, by day or night, you can even choose your setting. Fast action out at sea or cruising on the Thames or Medway, your scenery options are extensive, from the White Cliffs of Dover, to St. Katharine’s Dock by London’s Tower Bridge, sedately against the picturesque town of Henley or even the Palace at Hampton Court, the ideas are endless. Our experience gives us an understanding of patience and principals for filming continuity and the need for precision re-takes. With safety considered the manoeuvring of the boat can be repeated to assist film crew requirements. We’ve already enjoyed the pleasure of hosting a number of artists and corporate ventures for film and photo shoots, including the provision of luxurious nautical transportation to and from London, the O2 Arena and out to cross-Channel destinations. A partial list includes War of the World’s cast Jeff Wayne, Jennifer Ellison, Shannon Noll, Alex James also Kenneth Benson, DiamondGirlz, the Ferrari Owners Club, Red Carpet Productions, ITV’s this morning show and the Daily Mail. 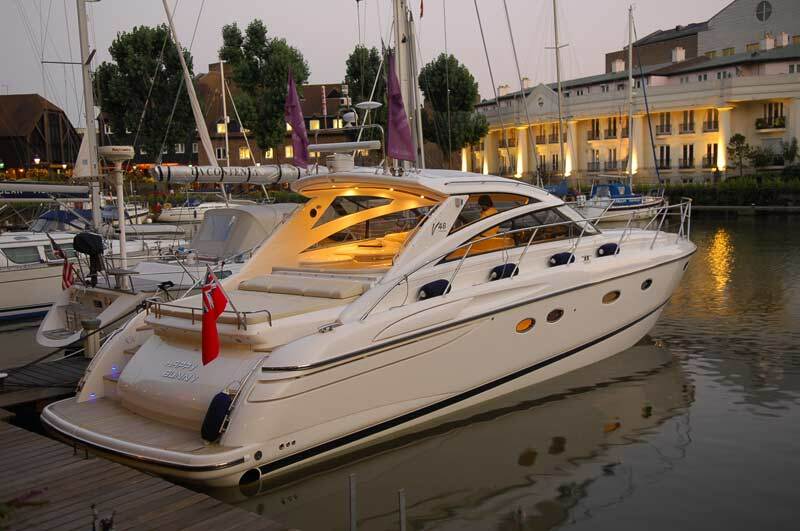 Linton Motor Yacht Charters are based at Chatham Maritime Marina on the River Medway, providing bespoke motor yacht charters from the River Medway and beyond. All our motor yacht charters are based on board a Princess V48, called Happy Bunny, a luxurious sports motor boat which is licensed to carry up to 10 Guests. Everything on board is to the highest standard. We only serve the best quality teas and coffees. We have a full range of twinnings teas including fruit, camomile and green teas. For coffee lovers, we use the Nespresso capsule system which guarantees an exceptional coffee everytime. Long lattes, frothy cappuccinos and rich expressos are all on offer. Happy Bunny is a fully licensed premises and has an extensive cellar of fine wines, champagnes and spirits. Standard champagnes include Bollinger, Veuve Clicquot and Laurent Perrier. For the discerning customers, we can also provide Krug, Perrier Jouet, Dom Perignon and Cristal. We have a wide selection of Molton Brown products on board for your pleasure. Scented candles and room sprays, as well as handwashes and lotions that gently cleanse and moisturise while leaving your hands delicately fragranced. For your convenience, we have kept our website simple and easy to navigate. Just click on the tabs for more information on the charters we can provide on our motor boat along with a sample itinerary. We cater for both private and corporate events. The Vessel provides you with full details of what you can expect on board. You can see for yourself the beautiful interior of our luxury motor boat, giving the perfect venue for a special celebration or a fun day out. The photo gallery shows some of the trips we have taken on the River Medway, River Thames and further afield into Belgium and the Channel Islands to give you a taste of what you could enjoy with Linton Motor Yacht Charters. We are happy to take your calls to discuss what we can offer in further detail or, alternatively, you can contact us via email. Linton Motor Yacht Charters wish to welcome you on board.